Biosurfactants are derived from natural and biodegradable renewable resources that are produced by bacteria or fungi. Like vegetable-based and petroleum-based surfactants, they can have excellence emulsifying, foaming, wetting, dispersing and even remediation properties. Over the period of time, the adverse impact of the synthetic surfactants on various things as well as on the environment, has led to the adoption of biosurfactants all over the world. Surfactants are surface-active amphiphilic compounds that require high cost of production, that use glucose as the sole source of carbon. But the use of bagasse and orange peels can increase the production by 20%. Therefore, continuous innovations can lead the global biosurfactants market to grow. Goldstein Research analyst forecast that the global biosurfactant market size is set to reach USD 6.4 billion by 2024, expanding at a CAGR of 16.7% over the forecast period i.e. 2016-2024. The availability of the hydrophobic compounds, innovations in making biosurfactants, low toxicity and biodegradable features are some of the factors that will grow the market as per the forecast. The report covers the present ground scenario and the future growth prospects of the biosurfactants market for 2016-2024 along with the sales and revenue of the biosurfactant. We calculated the market size and revenue share on the basis of revenue generated from major players across the globe. We have forecast the market on the basis of shipment data of the biosurfactants, manufacturers and distributors of the biosurfactants, market trends, and investments. Biosurfactants market report has been prepared based on an in-depth market analysis from industry experts. The report covers the competitive landscape and current position of major players in the biosurfactants market. The report also includes porter’s five force model, SWOT analysis, company profiling, business strategies of market players and their business models. Global biosurfactants market report also recognizes value chain analysis to understand the cost differentiation to provide competitive advantage to the existing and new entry players. On the basis of type, glycolipid dominated the global biosurfactants market with a revenue share of 42.6% in 2016. The major glycolipids such as rhamnolipids, trehalolipids and sophorolipids have the compound structure that lowers the surface and interfacial tension, thus it is highly preferred in biosurfactants. Of the total biosurfactants, 60% are glycolipids. Biosurfactants are predominantly used in environmental remediation and it has the major application share, and it is expected to grow at a rate of 11.6% over the forecast years. Based on geography, Europe had the largest market share of 32.4% in 2016, having the maximum number of manufacturers producing biosurfactants in this region such as Ecover, Biotensidon and more. Europe is the opportunistic market in the growth of biosurfactants, with the major application in environment remediation in order to achieve the sustainable environment goals. Countries such as Switzerland, Finland, Sweden, Denmark, Spain, the U.K. and others have high ranking in environmental performance index, thus being the most opportunistic countries for penetration of biosurfactants. There is a rising trend of application of inoculants of biosurfactant producing bacteria for the phytoremediation of hydrocarbon polluted soil. Application of the biosurfactants in phytoremediation on a large scale is attracting more innovations in this field. 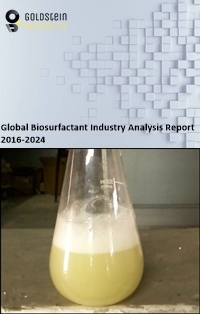 According to the report, major driving factor for the growth of biosurfactants market is the steps taken towards mitigating the adverse impacts of the synthetic surfactants, which is depleting the non-renewable resources, non-degradable as well as the toxicity being passed on to the consumers, are impacting the growth of biosurfactants market. Further, though biosurfactants are ecofriendly, but some experiments have shown that under certain circumstances biosurfactants can be toxic to the environment. The major challenge for the biosurfactant producers is to have careful and controlled use of surface active molecules in such a way that can cleanup of the toxic environmental pollutants and provide a clean environment. Global biosurfactants market report comprises of the following companies as the key players in the biosurfactant market: Ecover, Biotensidon, Jeneil, Evonik, Biotech, Urumqui Unite, Saraya, and MG Intobio. What is the revenue of global biosurfactants market in 2015-16 and what would be the expected demand over the forecasted period?